When mixing music you want a pair of studio monitors that will accurately reveal the truth about what you're listening to, and the Eris series from PreSonus are designed to do just that. With its 8" Kevlar low-frequency transducer, the Eris E8 provides an extended low-end all the way down to 35Hz, and performs with a bit more muscle than the smaller E5. 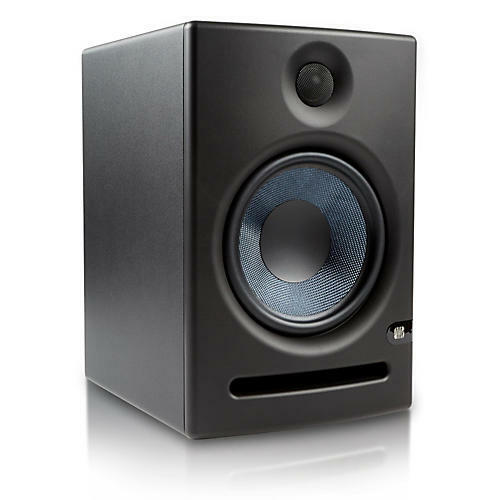 Eris speakers are real studio monitors, delivering a very accurate response with a tight bass and very clear upper end. That's what you need in a home studio. Thanks to well-designed Kevlar low frequency transducers, low-mass silk-dome tweeters, responsive Class AB amplification, and professional acoustic-adjustment controls, Eris delivers the goods. Today's music producers deal with a wide variety of musical genres and often work in more than one location. It's easy to take your Eris speakers with you when you want to work in a different space. It's almost as easy to customize their sound for your room and type of music. The most basic control is the Input Gain, which determines the signal level before it reaches the power amp. This is part of gain-staging your overall system-that is, setting the levels for every part of the recording chain in order to get the optimal level of clean audio all the way through. Once you've gain-staged your system, you can leave this control alone. Eris monitors also provide over-temperature protection to avoid heat-related issues, current-output limiting (to prevent damage should there be a short circuit on the speaker terminals), and subsonic protection to filter out extremely low-frequency vibrations that could interfere with the woofer's performance. Finally, Eris' power amplifiers have a "soft startup" so that you don't get damaging pops in the speakers when you power them up.